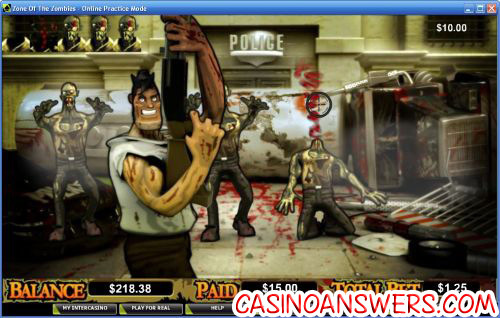 Zone of the Zombies Video Slot Guide & Review - Casino Answers! 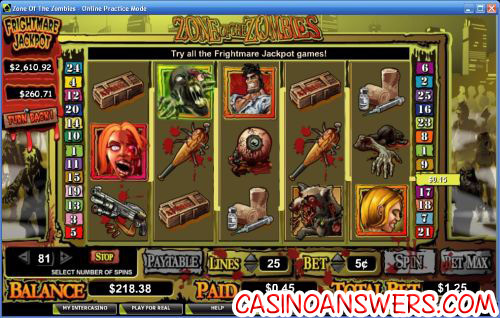 Zone of the Zombies is a 5-reel, 25-line video slot developed by Cryptologic. It features a two-tier progressive jacpot, a bonus game, scatter wins and a wild substitute symbol. You can play Zone of the Zombies at any Cryptologic online casinos such as InterCasino and Casino Joy. Before this review begins, one thing has to be perfect clear; Zone of Zombies is not for the weak at heart. There are eyeballs popping out, bloody chainsaws, hacked off limbs and all sorts of crazy stuff. However, if you’re a fan of the zombie genre, perhaps the George Romero films like Dawn of the Dead, Evil Dead or even the recent Zombieland film, then you will get enjoyment out of playing Zone of the Zombies. As mentioned, Zone of the Zombies is really gory. Symbols include the zombie wild symbol (animated so that he’s coming at you), the hero with the chainsaw scatter symbol, a zombie chick, a truck with a flamethrower, a zombie dog, weapons, zombie limbs, zombie eyeballs, ammo and a needle and syringe. Bets on the Zone of the Zombies slot machine are $0.01, $0.02, $0.03, $0.04, $0.05, $0.10, $0.15, $0.20, $0.25, $0.50, $0.75, $1, $2, $3, $4, $5, $6, $7, $8, $9 and $10. Bets are per line, so the maximum bet on the Zone of the Zombies video slot is $250. The range of betting options available makes Zone of the Zombies suitable for all types of casino players, from low stakes casual players to the highest of high rollers. The top fixed jackpot on Zone of the Zombies is 6000X when you hit 5 eye-popping zombie wild symbols. The wild substitute symbol will substitute for all symbols except the scattered hero symbol. The other zombie is the second highest fixed jackpot at 1000X. The scatter symbol is the chainsaw-wielding hero. Scatter wins are multiplied by the total bet and added to the payline wins. If three or more scattered hero symbols appear on a spin, you will trigger the Zombie Feature bonus game. In the Zombie bonus game, the hero (you) must fight through a horde of five zombies to get to the police station. Random prizes are awarded for each zombie you destroy. Additional prizes will be awarded if you make it to the police station. The bonus game will end when you either get to the police station or the zombies attack you. All prizes in the Zombie feature will be multiplied by the triggering bet. The Zone of Zombies video slot is linked with the Frightmare Jackpots. These are randomly awarded on any spin you make. The size of the wager you make determines your chance of winning the progressive jackpot, so make sure to bet high for your chance to win! As of the time of this writing, these jackpots are at $410 and $4,235 and ready to be won at any time. You can also play for these jackpots on Cryptologic’s Vampire Bats and Witches And Warlocks video slots. Zone of Zombies is a video slot that any big-time horror fan will enjoy. It has all of the blood, gore and violence of a zombie flick compacted into the form of an online casino video slot. If you’re the type of person that has a zombie survival kit ready just incase, you should try out the Zone of Zombies video slot at InterCasino! Are US players able to play Zone of the Zombies for real money? Players from the United States are prohibited from playing at Cryptologic casinos for real money. They can, however, play at Millionaire Casino. Millionaire Casino is constantly adding exciting new video slots all of the time and you never know… maybe a zombie video slot will be next! Does Zone of Zombies have a progressive jackpot? Zone of Zombies is linked to the Frightmare Jackpots, along with Witches And Warlocks and Vampire Bats. There are two jackpots, one in the hundreds of dollars and the other in the thousands of dollars. Frightmare Jackpots are won randomly which means that any spin you can win! Where can I find more Halloween slot reviews? If you’re a big fan of the walking dead and are looking for more zombie-themed slot game reviews, please read our list of Halloween slots. Are there any zombie based casino games?